In 2020, the US must pass presidential elections. This will be a serious exam for the current head of state, Donald Trump, whose board is accompanied by various scandals 24/7. During his election campaign, the entrepreneur has earned a reputation as a populist, constantly giving various promises, the possibility of implementation of which was questioned by experts. Let's look at 10 points that Trump could not implement. During the election race, Donald Trump promised to normalize relations with Russia and build a personal dialogue with Vladimir Putin. In particular, he pointed out the need for interaction between Washington and Moscow to resolve conflicts in the Middle East and fight terrorists. In reality, in the United States, an epic began around “Russian interference in the elections,” which was eagerly picked up by the American Democrats and the media. Trump was called the puppet of Russian President Vladimir Putin, who was supposed to destroy the States from the inside. An investigation was initiated into possible links between the Trump team and the Kremlin, which was assigned to special prosecutor Robert Muller. 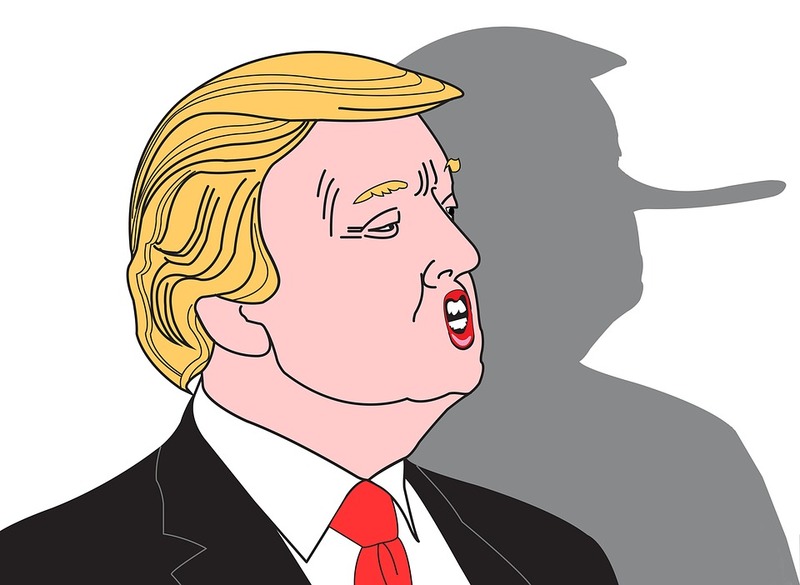 The results of this "theater of the absurd", which Trump himself called "witch-hunt", became known in 2019: the president was innocent, which upset journalists who, for several years, not only fasted fakes, but also received awards for them. We are talking about The New York Times and The Washington Post, which in 2018 was awarded the Pulitzer Prize "For a report promoting the nation's understanding of Russia's interference in the 2016 presidential election and its connection with the campaign of Donald Trump, his campaign headquarters and future administration." And what about the normalization of the dialogue? It did not happen - even the Helsinki summit in 2018 did not help. Instead, relations from 2016 continued to sink to the bottom: the United States constantly introduced new sanctions, voiced baseless accusations and fiercely opposed Moscow at international sites. This is largely due to the behavior of Donald Trump himself, who is trying to intimidate his interlocutor in order to extract the maximum preferences for himself. A similar model was tested on North Korea, China and NATO allies. However, it misfired with Moscow. Also, do not forget that the president represents the Republican Party, which occupies a hard line against Moscow. He surrounded himself with hawks like Mike Pompeo and John Bolton, who were interested in confronting Moscow, which allowed him to increase defense budgets. Therefore, the failure on all fronts was inevitable. Donald Trump loudly promised to destroy Islamic terrorism. His allies in this field, he called Jordan, Israel and Egypt. The politician also wanted to defeat the Islamic State and Al-Qaida and cut off the funding channels for the Palestinian group Hamas and the Lebanese Hezbollah. At the same time, he called Iran the main sponsor of terrorism. A few years have passed, but the promises have not been realized. Yes, the Islamic State militants have lost influence in Syria, but this is due not only to the States, but also to other players, including Russia, Iran and Turkey, who acted contrary to the White House. According to the reports of the Russian Ministry of Defense, the States are more disturbing than helping to counter-terrorism, facilitating the transfer of radicals to Afghanistan and other regions. It is also worth recalling the rocket attack on Syria in April 2017, organized thanks to a provocation with chemical weapons, behind which stood the White Helmets group sponsored by the White House. As for Iran, Trump unilaterally withdrew from the nuclear deal with Tehran and resumed the sanctions, putting at risk its European partners interested in normalizing the dialogue and indicating the absence of violations from the Iranian side. Before his victory, Donald Trump repeatedly pointed out the mess in the Middle East. His dissatisfaction was also caused by spending trillions of dollars, which Washington wasted for nothing on the fighting in the region. Therefore, in the event of victory, the entrepreneur politician promised to return the soldiers home. Now it's 2019, but the promise is only partially fulfilled. So, in September 2017, Trump decided to additionally transfer 3,000 troops to Afghanistan, but he took this step on the recommendation of advisers. It is possible that after the conclusion of an agreement with the Taliban on the fight against terrorism, the position will be revised, but for the time being in Afghanistan the contingent is planned to be reduced only from 14,000 to 7,000. The decision to withdraw American soldiers from Syria provoked a conflict in the US Department of Defense. Therefore, the head of department, James Mattis, resigned, pointing directly to the contradictions with the chief on the issue of Syria. As a result, the plan was partially revised: a certain "peacekeeping contingent" will remain in the region. And in March 2019, James Jeffrey found it difficult to name the specific dates for the withdrawal of soldiers. According to the promises of Donald Trump, large-scale construction in the country will make the American infrastructure the best in the world, and will also create millions of jobs. The plan fits into the general logic of the economic program of the team of a businessman, but in reality the White House is mired in problems. According to preliminary estimates, the president wanted to spend on the construction of infrastructure facilities about 1.5 trillion dollars. But in March 2018, Congress agreed to allocate only 21 billion. But the main scandal was the failure of a large-scale project to launch a bullet train from Los Angeles to San Francisco, estimated at 77 billion dollars. Trump himself said about the huge cost overruns and even demanded from the California authorities to return $ 2.5 billion. However, he did not hide the fact that the construction of a new railway prevented the construction of a wall on the border with Mexico. Probably the most famous promise of Trump, whose main point was the construction of the wall on the border with Mexico, for which the Mexican authorities will pay. He also threatened to expel about 11 million illegal migrants from the country and to tighten the procedures for obtaining residence and citizenship rights. It is worth paying tribute: the current President of the United States has made serious efforts to implement his plans. However, the plans were not appreciated by American society, which fiercely resisted any attempts to put pressure on people. The court also took their side, which is why some of the decisions of the White House in the migration sphere were neutralized. And what about the wall on the border with Mexico? First, Mexico City refused to pay for its construction, confining itself to a number of preferences for American companies. Secondly, attempts to knock out money for the implementation of the plan provoked a massive shutdown, because Donald Trump could not conclude an agreement with members of the Democratic Party in the US Congress. According to the latest data, the Pentagon in the near future will still allocate about a billion dollars for the construction of infrastructure facilities, but it is unclear whether this amount is enough. It also raises the question of wall effectiveness. Another point was the ban on the entry of Muslims in the United States. Already in January 2017, Trump signed the so-called decree "Protecting the nation from the entry of foreign terrorists into the United States", under which the citizens of Iran, Syria, Libya, Somalia, Yemen, Chad, Sudan, Iraq and so on were temporarily banned from visiting the country Further. In the same year, a New York court allowed temporary stay in the United States to persons who arrived in the country with open visas and are subject to a migration decree. As a result, the document was substantially rewritten. Now it limits the possibilities of citizens of Libya, Somalia, Yemen and Syria. Also included in the list are two non-Muslim countries - Venezuela and the DPRK. There are a number of other favors. The new edition of the initiative, significantly different from the original idea, in 2018 was supported by the US Supreme Court. Donald Trump actively criticized his predecessor Barack Obama, who pushed through the law on affordable medical care Obamacare, thanks to which 20 million uninsured Americans were able to get health insurance. However, attempts to destroy Obamacare failed. The politician could not push through the initiative through the congress, and several federal judges in Washington blocked a number of White House demands. Yes, in December last year, a federal judge in Texas declared the law on affordable health care unconstitutional, but the decision is already appealed, and a new one can be made after 2020. Everyone agrees that Obamacare is not working. Republicans are developing a more serious bill that will be cheaper and more efficient. But It will be adopted only after the Republicans win both in the Senate and in the House of Representatives. During the 2016 election campaign, in which Hillary Clinton and Donald Trump clashed, both sides poured a huge amount of dirt on each other. However, former Secretary of State Clinton made a fatal mistake by deciding to use a personal mail server for business purposes. On the criticism of such actions, Trump built a significant part of his campaign, but in the end, the FBI found no reason to bring any charges against Clinton. Despite this, the US president continues to insist on the need for Clinton to go to jail. For example, in August 2018, the former employee of Pluribus International who worked with the Pentagon and the NSA, Reality Winer, was sentenced to 63 months in prison. As the investigation established, the woman sent a secret report via e-mail to the Intercept publication. At one time, Donald Trump repeatedly criticized the North Atlantic Treaty Organization (NATO), pointing out that the alliance is dead. According to the politician, the partners of the States literally sat on the neck of Washington, pulling money. Having come to power, Trump seriously scared the Allies, demanding a substantial increase in defense spending. Resistance was eventually overcome, and the decision of the United States to withdraw from the INF Treaty raised the question of the possible transfer of American missiles to Europe. As a result, NATO continues to exist, and Donald Trump himself even calls for Brazil to be included in the alliance. As mentioned in the paragraph about NATO, US President Donald Trump is confident that a significant number of Washington partners are sitting on its шneck. Therefore, even during the election campaign, he stated the need to revise the conditions of a number of agreements. Partially the promise was fulfilled, but the price turned out to be extremely high. So, in 2017, the States announced their withdrawal from the Trans-Pacific Partnership, which allegedly did not fully take into account American interests. Despite this, the remaining countries signed a new agreement, and also indicated the need to combat such actions by the United States. Donald Trump also achieved the termination of the North American Free Trade Agreement between the United States, Canada and Mexico (NAFTA). At the same time, he managed to quarrel with Mexico and Canada, and then reconcile and agree on a new treaty. The promises of the head of the White House to pursue a more rigid foreign trade policy provoked a large-scale economic conflict between the United States and China. Substantial trade restrictions were imposed on Beijing, which the Chinese authorities could not adequately respond to. When reviewing the customs policy, other players in the market suffered, including European countries. Even if the US and the PRC reconcile the contradictions, the position of Washington has suffered significant damage. Thus, the EU countries have already thought about reconsidering their priorities, which is connected with the desire to avoid American pressure not only in the economic, but also in the military sphere. And the fight against Chinese companies dealt a blow to American farmers, about whom Trump was so concerned. So, soybean producers targeting the Chinese market will need about eight years to return to peak export values ​​(according to reports from the US Department of Agriculture). The fact is that Beijing introduced 25 percent duties on legumes from the States, and also shifted to supplies from Latin America. And in the world there is a process of gradual abandonment of the dollar. Part of the military contracts with India, China and Turkey will be paid in other currencies, thus avoiding Washington sanctions.